When I worked in my liquor store back in the States, I became enamored with old, long lost cocktails that once held a place in the better bars around the world. I studied the Martini, originally 4 parts red vermouth to 1 part gin. I fell in love with the Manhattan, only after I found that the key was straight rye whiskey and high end vermouth. Soon, I found myself collecting vermouth from around the world to use in these once “exotic” drinks, feeling as though I was one of the few who recognized the essential ingredient of good vermouth to mix a fantastic drink. Boy was I wrong! It was shortly after arriving in Spain when I started to see signs in bars announcing that they had Vermut de Grifo, or Vermouth on tap. I thought to myself, “Silly Spaniards, don’t they know how to use vermouth correctly?” I couldn’t find one good Martini glass in any bar around town, but they had vermouth on tap? For months, I ignored the signs and stuck to my guns swearing that vermouth was to mix, not to drink. Now, fast forward approximately six months to a dark stormy night when we met up with a few new friends whom we I had found on the blog, The Full Bottle, maintained by a Spaniard and an American living in Madrid. Having food and wine as our mutual interests, the conversation pretty much stayed in the same vein all night. Eventually, the conversation meandered towards Vermouth when I asked Juan what his thoughts on vermouth being sold on tap. His was response was not what I had initially expected when he said, “I like it!” Previous to this enthusiastic statement, I believed that only a false wine lover would acknowledge vermouth as a stand alone drink. So, what did we do? We flew out of one vermouth bar and onto another for an evening of Vermouth tastings. In all honesty, I was a bit afraid of what exactly we would find, but I am always willing to try something at least once. Placed before me at the next bar was a dark inky beverage with an ice cube and a twist of orange. When I say inky, I mean it! It was so inky that if I had had my fountain pen with me, I might have filled it with a bit just to see what would happen! Hesitantly, I slowly put the glass to my lips, determined to take only a sip, but when I smelled the first notes of deep herbal fruit, I rapidly changed my mind and took a mouthful! I remember the first time I sat behind the wheel of a car with no instructor next to me while my parents watched with parental knowingness from the front of the house aware that I was entering a new stage of my life. I remember feeling like I was free to explore and go down roads new only to me and to discover things I had not yet experienced. That first sip gave me some of the same feelings I had when I left my parents’ garage for the first time. Here was a substance slightly sweet with a refreshingly bitter finish and flavors that changed and developed as you slowly drained the glass. Intense, alive and available everywhere! Almost every bar in Madrid has a vermouth tap, and while I’m sure that some bars share similar suppliers, they all claim to follow their fathers, mothers, or grandmas old recipe. As the first taste slowly faded on my palate, my eyes opened wide and a grin spread across my face as my companions witnessed my rebirth. I was in love – vermouth was my new best friend. In the days that followed, I ordered vermouth everywhere, pleased to find that every place had a slightly different version. Some sweeter, some drier, though always red, they ranged from deep molasses in color to light Bing cherry red. The flavors that danced on my tongue ranged from fresh berries to dried fruits and from minty-rosemary like herbs to bitter orange. My tongue was alive! Turns out vermouth is to be drunk alone, though I will say that Martini and Rossi leaves something to be desired. 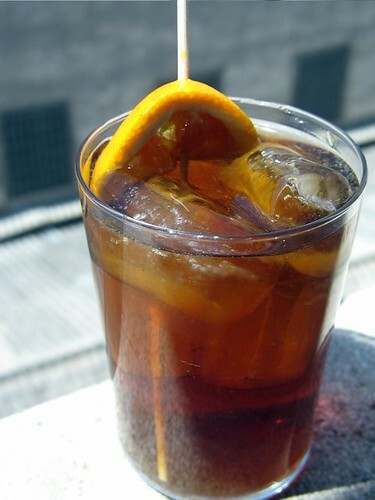 When you come to Spain, make sure to sidle up to a bar and ask your bartender, “Give me one vermut de grifo porfavor!” Why not? What do you have to lose? You just might find a new treat. Light golden brown in color. The nose shows a honey/caramel quality that is surrounded by rich herbal notes. Vanilla, dusty earth, thyme and other unidentified herbs all round out the complex nose. Medium sweet as far as vermouth go with a rich bitter finish that lingers. The flavors show caramel, sweet cherry, mixed herbs and some orange rind. Really a nice vermouth to sip on the rocks. In all honesty, I’ve had this once by itself, and it was nice enough to look for it again, but the truth is that when a friend of mind came to town for a visit and brought me a bottle of my favorite rye whiskey, most of this bottle found its way into my Manhattans! So for now, I encourage you to try vermouth sometime and see what you think. If your in the States, make sure to check out Andrew Quady’s VYA a personal favorite, and if your in Europe, ask around you might just find something new!